As we all prepare for a busy caving season FRS have positions available for experienced milkers and general farm workers to meet the seasonal demand. Go to www.frsfarmrelief.ie/careers to download an application form today and e-mail or post it to your nearest FRS office. Farmers are advised to book their operators now as demand is high. Farmers will be all too familiar with the compliance requirements around calving, such as the necessity to tag and register calves within 27 days of their birth. 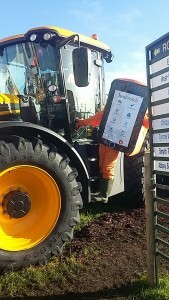 This can now be done in seconds and on the go with the Herdwatch App on the go. Before Herdwatch there was only 2 ways of registering calves compliantly: by post or by computer, and that usually meant working late at night. Now you can do away with paperwork or switching on your computer late at night. With Herdwatch, you can register your calves in 30 seconds from a smartphone or tablet App, anytime, anywhere. Unlike with postal calf registration, you don’t have to pay for stamps & ink, and you get immediate feedback from the Department, which means most inconsistencies or data entry errors can be picked up and corrected immediately, rather than having to wait 3 or 4 days to find out in the post. Visit www.herdwatch.ie today or text FRSTIPP to 51444 for a call back from the Herdwatch team. Now is the time to do a pre-calving walk-through of your pens, chutes and calving pens. All equipment and calving areas should be clean and ready to use. It’s always better to prepare these items in the light of day rather than scrambling to make them right at night when the first calf in on its way. Every farmer needs the following supplies on hand during calving: disposable obstetrical sleeves, calving Jack, injectable antibiotics, lubricant and disinfectant. Other helpful items to have around are flashlights, old towels and even a bucket of non-detergent soap and warm water. If possible, make up a portable kit so you can quickly move your supplies to wherever your cow is calving. The spring is a very busy time on the farm and farmers work long hours with very little sleep. Rushing can cause unnecessary accidents so work at a steady pace and get labor in to help alleviate the pressure. Having supports in place to fall back on, if or when you need them, will bring you through this busy time more effectively and safely. Join the FRS Membership Benefit Scheme and get reduced farm services rates, Sickness & Accident Support and Death & Capital Benefit for only €295 – That is Peace of Mind for Only 81c per day. Visit www.frsfarmrelief.ie/membership for more details. As the sun sets on this year’s ploughing, we can all sit back and relax after a tremendous three days. This year’s event marked the most successful in history with a record breaking 281, 000 people having landed in Ratheniska Co. Laois over the three days. The Farm Relief Services marquee proved once again to be a great success with floods of people coming in to chat to our team and sign up to the courses and services on offer. The FRS team from all our divisions were out in force giving information about our services. Outdoors the FRS fencing team ran with a great display of the various fencing they supply and one lucky visitor, Rosemary Dunne from Tullamore won a €500 Tinsley wire voucher. The FRS Training team were kept on th eir toes over the three days with their Boom Sprayer demonstrations. This was a great success attracting great crowds to the stand whilst the demonstrations were taking place. A large amount of people signed up for the sprayer course which is required to be completed by November 2015. Those who signed up for the course were entered into a draw to win a free course. A huge congratulations, to Thomas Dillon from Listowel, Co. Kerry who was the winner of the spraying course. Herdwatch once again came out of the event with great results having gained 200 new subscriptions to the award winning App and talked to many of their current customers. The App itself is going from strength to strength receiving great feedback from all who came to visit them in the FRS marquee and also in the Innovation arena. 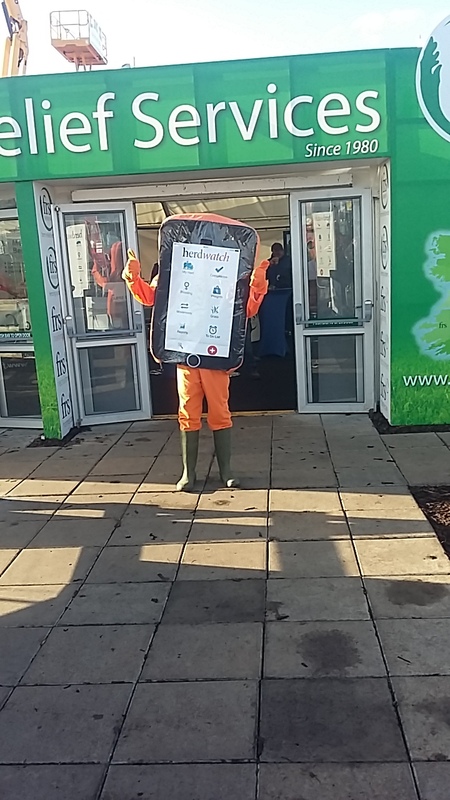 The big attraction of this year’s ploughing event was the Herdwatch mascot Herdie who was out and about promoting Herdwatch and was a big hit on the trackway. People of all ages stopped to get their photo taken with Herdie for the Twitter competition. Congratulations to the lucky winner from Kerry who won their county jersey for uploading a photo of themselves with Herdie. For each tweet about #Herdie, Herdwatch donated 50cent to Embrace Farm. 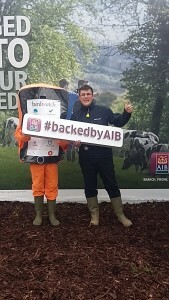 A whopping €500 in total was raised for Embrace Farm thanks to Herdwatch. This year we were delighted to have Tom Maher and Marie Spencer from St. Vincent De Paul who helped out at the FRS tea and coffee station for the three days. They welcomed everyone with a smile and kept the tea and coffee flowing. They raised over €900 for their charity at the event. And so that is another year at the ploughing done and dusted. We look forward to planning for next year. Thank you to all the staff who helped out, to all our customers and the people who came to visit our stand. As always it is greatly appreciated. In 2015, for the first time in over 30 years, farmers can now expand milk production without the hassle of milk quotas. 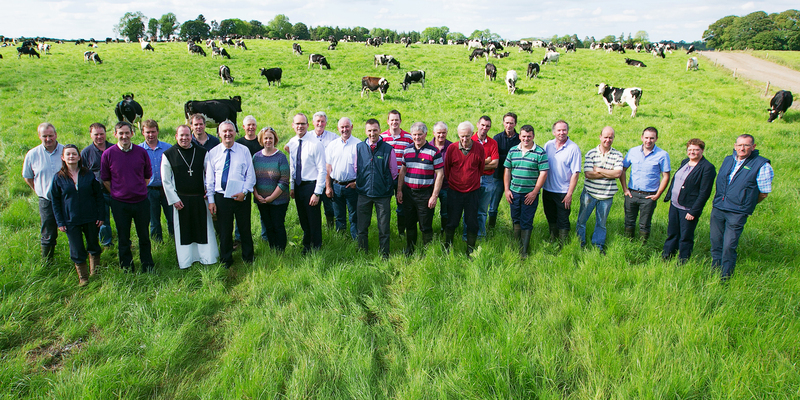 The whole abolition of quota presents great opportunities for dairy farmers to expand. There will be undoubtedly success for many, for others, however, expansion may bring heavier workloads and increased stress without any long term benefits. The main requirement for the whole expansion process is that it is stainable from all aspects for the business perspective. This basically means, that the business should focus on the accurate conversion of home grown feed to saleable products that are recognised as being of high quality and are safe to consume. In a lot of cases, expansion is not planned effectively. There is no money in expansion the money only starts to come in once you have expanded. From farm to farm, the amount of investment needed varies. Expansion costs are indeed very individual. • Plan your farm with labour efficiency in mind, design sheds, roads, yards, milking parlour and handling facilities with cow and operator comfort and safety in mind and also with the objective of getting the job done quickly. • Plan your time in advance to make the best use of it and your farm worker’s time. Don’t be afraid to delegate and don’t get over worked as it will do you no favours in the long run. • Use only skilled, trained, insured staff. FRS can provide this as well as giving you one invoice which is tax deductible. Black market labour can be very costly if the work is not carried out correctly, it can also end up costing you more if you compare to the net cost of using FRS (including for tax deductibility). • Make a plan for your record-keeping, don’t let paperwork get on top of you or keep you from the important business of farming. Check out Herdwatch our new software and app for herd management to make your paperwork and compliance recording more efficient. It saves farmers up to four hours per week on paperwork. www.herdwatch.ie for more information. 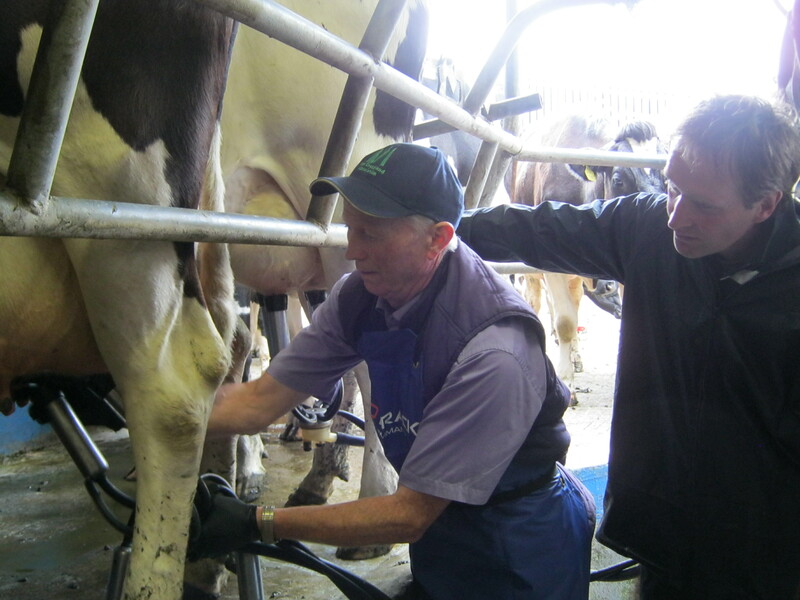 • Evaluate your own training needs – enrol in the FRS/AHI/Teagasc, Best Practice in Milking Course – it should improve your routine and milk quality. It will also gain you a FETAC Level 6 Certificate. Identify any other training needs you may have and get your-self upskilled eg. financial, time management, chainsaw safety, spraying operations, Quad bike etc. Check out www.frstraining.com for specialised agricultural and business courses. • Protect your livelihood by planning for unforeseen circumstances such as accident or illness. Join the FRS Membership Benefit Scheme which gives you the peace of mind that your farm will be looked after if you are unable to work. 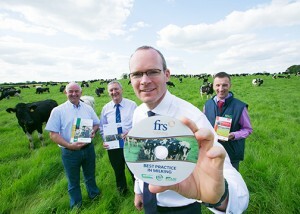 Visit www.frsfarmrelief.ie/membership for further details. • Make sure your farm is a safe and comfortable working environment. Are there any areas which could be made safer or more efficient? Complete or update your safety statement and check out farm safety courses available through www.frstrainig.com. • FRS can help you to plan for expansion, call us for confidential, no-obligation free advice. We can tailor packages to suit your farm needs. Realistically sustainable expansion has three main aims: Firstly, It should be profitable for the farmer. Secondly, it should look after the environment and thirdly it should improve the lifestyle of the farmer over all. It is already evident since the abolition of milk quotas that there is going to be a significant increase in milk production over the coming years.